Superpowers: Creating illusions with amateur magic, she can only use her magic when she has a potion or powder. Rabia is a very friendly person and easy to become friends with. Thanks to one of her bad habits she mostly stays up all night and wakes up around 11:30 am, which makes her really moody and gives her a short temper. Rabia always had an interest in magic an illusions. She has just moved to St. Canard with her little niece Besma. The first people she met were Drake and Gosalyn Mallard, also their first friends in St. Canard. She doesn’t have any money and can barely pay for a place to live, so she decided to use her amateur magic for evil. by stealing money, jewels and other valuable things, she can pay for a place to live, food, etc. 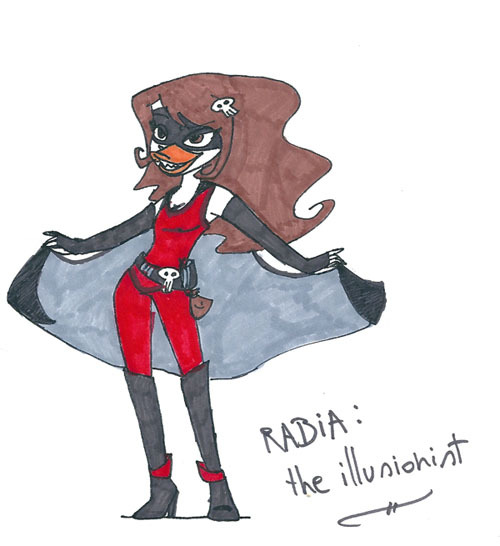 But a lot of times she was stopped by Darkwing Dork.